Bronisław Kasper Malinowski (April 7, 1884 – May 16, 1942) was a Polish anthropologist widely considered to be one of the most important anthropologists of the twentieth century. Malinowski was a pioneer in developing the field of cultural anthropology. Together with his colleague, and sometimes rival, Radcliffe-Brown, they established the methodological foundations of ethnographic fieldwork and theoretical analysis that have come to define the discipline. Malinowski showed in detail that no matter how strange or exotic various practices might appear to outsiders, they were an integral part of the healthy functioning of that community. He demonstrated that even so-called superstitions had a logic and function within the context of that society, helping it cope successfully with environmental and social challenges. By showing that so-called primitive peoples are capable of the same types and levels of cognitive reasoning as those from more "advanced" societies, Malinowski helped discredit Social Darwinist claims that all societies passed through distinct and predictable stages along a single linear trajectory. His work revealed that these societies and their members were far more complicated, and far more diverse, than previously imagined. His research focused on Melanesia, where he conducted his famous studies of the Trobrianders, including their form of gift exchange known as Kula ring. Malinowski's work brought the value of such previously unappreciated cultures to the attention of those in developed societies, showing that there is much to learn about human nature and human society from all people, no matter how "primitive" or strange they might initially appear. It brought the world closer to becoming one human family, in which all people can be embraced and contribute to the happiness of humankind as a whole. Bronislaw Kasper Malinowski was born on April 7, 1884, in Kraków, Austria-Hungary (in present day Poland) as the only child to Lucyan and Jozefa Malinowski. They were an upper-middle class family. His father was a professor of Slavic philology and his mother a linguist, the daughter of an upper-class, land-owning family. As a child he was frail, often suffering from ill-health, yet he excelled scholastically. He received his Ph.D. in philosophy, physics, and mathematics in 1908 from the Jagiellonian University. He graduated Sub auspicious Imperatoris, the highest honor in the Austro-Hungarian Empire. He spent the next two years at Leipzig University, where he was influenced by Wilhelm Wundt, and his theories of folk psychology. Wundt similarly influenced the French sociologist Emile Durkheim. Malinowski had become acquainted with Sir James Frazer’s mighty work, The Golden Bough, which stimulated his interest in primitive people and a desire to pursue anthropology. At the time, Frazer and other British authors were amongst the best-known anthropologists, and so in 1910 Malinowski traveled to England to study at the London School of Economics. In 1914, he traveled to Papua (later Papua New Guinea) where he conducted fieldwork at Mailu and then, more famously, in the Trobriand Islands. He made several field trips to this area, some of which were extended to avoid the difficulties of emigrating from an Australian colony during the First World War. It was during this period that he conducted his fieldwork on Kula. It was also during this period he met his wife, Elsie Rosalind Masson. She was the daughter of David Orme Masson, an English born scientist who immigrated to Australia to become the first professor of chemistry at the University of Melbourne. When they met, Elsie was working as a nurses' aide. She had published An Untamed Territory (1915), and was interested to see some photographs of Malinowski's field work. Her parents were against the marriage, but six years later they married in Melbourne when she finished her nursing training. She learned Polish and became a Polish citizen, as he was. They began a fourteen year marriage that ended when she died in 1935. They had three daughters that they raised all over the world. By 1922, Malinowski had earned a doctorate of science in anthropology and was teaching at the London School of Economics (LSE). In that year his book, Argonauts of the Western Pacific, was published. The book was universally regarded as a masterpiece and Malinowski became one of the best known anthropologists in the world. For the next three decades Malinowski established the LSE as one of Britain's greatest centers of anthropology. He trained many students, including those from Britain's colonies who went on to become important figures in their home countries. Malinowski taught intermittently in the United States, and was a lecturer at Cornell University in 1933 and for several years after that. When World War II broke out during one of these trips he remained in the country, taking up a position at Yale University, although he remained actively identified with the Polish partisan cause during the war. His career at Yale was less spectacular than previously, but it gave him the chance to study peasant markets in Mexico in 1940 and 1941. There, he met Anna Valetta Hayman-Joyce, an artist who was painting under the name Valetta Swann. She assisted him in his Mexican studies and they married in 1940. He had plans for a study of social change in Mexican-Indian communities, but his death prevented their work on this. Anna was primarily responsible for the publication of his Scientific Theory of Culture (1944) and other posthumous works. 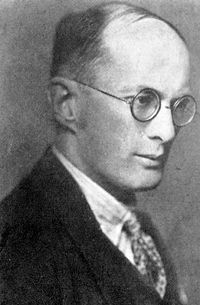 Bronislaw Malinowski died on May 14, 1942, in New Haven, Connecticut. Malinowski, together with Radcliffe-Brown, is considered a father of modern social anthropology. They had an uneasy and often stormy personal relationship, but were united in the cause to clear up fallacies created by Social Darwinist ideas about the inferiority of native people and culture. They both wanted to help stimulate a new, British school of anthropology. It is ironic that Malinowski became entirely embraced by the American anthropological school of Franz Boas. Malinowski established modern field work, and Radcliffe-Brown was a theoretician. Both were functionalists, but Malinowski saw the function of culture as serving the needs of the individual whereas Radcliffe-Brown regarded the individual as supporting society as a whole. Malinowski believed that "The functional view of culture lays down the principle that in every type of civilization, every custom, material object, idea and belief fulfills some vital function, has some task to accomplish, represents an indispensable part with a working whole" (Kardiner 1961). "Functionalism" was founded by Malinowski, but Radcliffe-Brown designated himself a "structural functionalist" in order to distinguish himself as separate from Malinowski. Together, their work established the methodological foundations of anthropological fieldwork. Previous anthropologists had conducted fieldwork through structured interviews and did not mix with their research subjects in day-to-day life. Malinowski emphasized the importance of detailed participant observation, and argued that anthropologists must have daily contact with their informants if they were to adequately record the "imponderabilia of everyday life" that were so important to understanding a different culture. Malinowski spoke numerous languages including Polish, Russian, German, French, English, Italian, and Spanish. He felt that fluency in speaking the languages of the native tribes he studied was important to him and the success of his studies. Malinowski also contributed to the cross-cultural study of psychology through his observations of the relationships of kinship. He found that with the Trobriand Islanders, their individual psychology depended upon the cultural context. This discredited the universality claimed by Sigmund Freud’s theory of the Oedipus complex. He stated that the goal of the cultural anthropologist, or ethnographer, is "to grasp the native's point of view, his relation to life, to realize his vision of his world." (Argonauts of the Western Pacific, 1961, p. 25.) Yet, he also saw the role of the anthropologist as going beyond the view of each individual member of the society, to understand how individual activities function as part of the societal whole. His famous studies of the Trobrianders, in particular their Kula exchange, typified his approach. In Melanesia, every year there was a ceremonial exchange of a bracelet and a necklace that involved a ring of many islands. The items were not made of particularly expensive materials nor represented excellent craftsmanship. This led Malinowski to investigate what function this could provide for the islanders. Each trade was with two partners, ensuring each a new necklace and a new bracelet. He found that each item traveled in the circle of islands in a different direction and linked over 700 various islands in the exchange ritual. Bronislaw Malinowski advanced cultural anthropology away from an evolutionary focus into a science that embraced a sociological and psychological field of inquiry. His influential writings and charismatic, warm character made him a very popular lecturer and inspired many of his students to pursue various occupations, mainly in the field of cultural anthropology. He showed that so-called primitive peoples are capable of the same types and levels of cognitive reasoning as those from more "advanced" societies. He helped defeat Social Darwinist claims that all societies passed through the same distinct and predictable stages, and in the same predictable order, along a single linear trajectory. His work revealed that societies and individuals were far more complicated and hard to predict, and that they varied tremendously. He showed in detail through his meticulous field work and brilliant observations that the wealth of diversity was far greater than previously imagined. Malinowski showed in detail that no matter how strange or exotic various practices might appear to outsiders, they were an integral part of the healthy functioning of their community. He showed the logic and function a practice would have within the context of that society. Although most developed world observers might think of magic as being merely superstitious, Malinowski showed the foundation that it had to the individuals within a particular context. When Trobriand Islanders went fishing in a lagoon, it was a simple matter. But when they had to go beyond the reefs, into the deep ocean, there were many dangers and unpredictable difficulties. This was the occasion in which the magic rituals re-enforced the ability for the fishermen to brave all these problems. The magic rites thus functioned to help them do what they needed to do. Malinowski's work anticipated the distinction between description and analysis and between the views of actors and analysts. This distinction continues to inform anthropological method and theory. His study of Kula was also vital to the development of anthropological theories concerning gift exchange and reciprocity. The material from the Trobriands was extensively discussed in Marcel Mauss's seminal essay The Gift. Malinowski’s ideas and methodologies were embraced by the American Boasian school of anthropology, making him one of the most influential anthropologists of the twentieth century. Parker, Franklin. 1973. The McGraw Hill Encyclopedia of World Biography. Vol 7, pp 117, 118. The McGraw Hill Company Inc. This page was last modified on 20 December 2016, at 15:53.